Private WILLIAM DULGARIANS CROMBIE G/8689 10th Bn., Queen's Own (Royal West Kent Regiment) who died on Thursday 9 November 1916. Age 16. 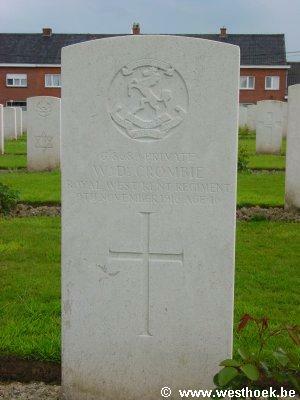 Private WILLIAM DULGARIANS CROMBIE ligt begraven op Voormezeele Enclosure N°.3 in Plot XII Rij B Graf 7.